Sales-producing point-of-purchase displays require a keen sense of design and manufacturing know-how. For Midland Metal Products, Chicago, IL, designing a new display for fabricating recently opened up a faster, more cost-effective to attach components to the display racks. Chicago’s Midland Metal Products fabricates these in-store cell-phone displays for a major discount retailer. Panels are punched in CNC turret presses from 4- by 8-ft. 20-gauge cold-rolled steel. By using a new Hybrid Threadform forming tool (from Mate Precision Tooling) for a display, Midland realized a 150-percent cost savings compared to previous fastening methods that required spot welding and use of self-clinching nuts. But the cost savings tell only half of the improvement story. Time-to-market facilitated by Mate’s fast threadform tooling process is equally important to Midland Metal Products, where selling seasons come and go quickly and the race to be first often determines overall success. Midland Metal Products is a fourth-generation family-owned designer and manufacturer of point-of-purchase displays. In addition to its turret punch presses, the firm also operates wire-forming machines, a six-axis gas-metal-arc-welding robot and an automated high-speed laser cell that process 60- by 120-in. sheets as thick as 7⁄8 in. Its pair of turret punch presses (Finn-Power/ Prima Power models) process 50- by 100-in. sheet to 3⁄8 in. thick, boasting the ability to carry 43 punching tools. Midland’s tooling library consists of more than 3000 tools. In a 100,000-sq.-ft. plant, Midland manufactures award-winning displays for a wide range of global-branded products, including clothing, toys, building supplies and snack foods. 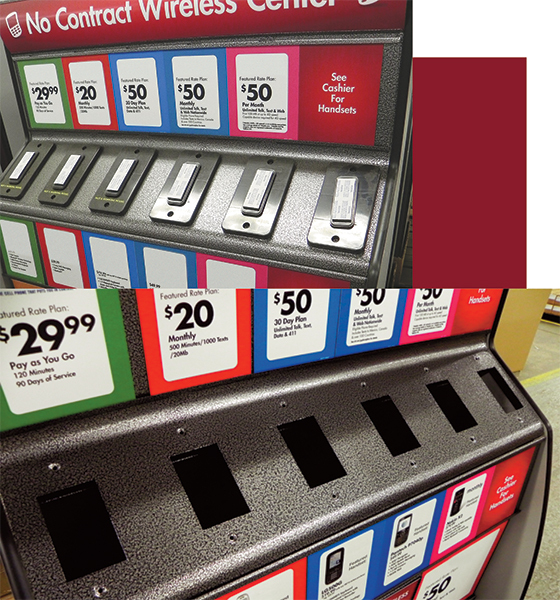 When challenged to fabricate an in-store display to introduce a new line of cell phones for a major discount retailer, Midland looked to develop a new method for fastening components to the shelves. The new process proved so effective that the company plans to use it wherever possible on future display designs. To fulfill the firm’s initial order for 10,000 displays, Midland Metal’s new threadform tool completed more than 240,000 cycles, each cycle requiring 24 thread helixes. “When planning prototype samples for the recent order of cell-phone displays, we analyzed the fabricating steps on the turret press,” reports operations manager B. J. McDonald. The panels are punched from 4- by 8-ft 20-gauge cold-rolled steel. To minimize setups, secondary operations and part moves, Midland consolidated as many of the punching operations upfront on the turret press. Those operations include sizing the panels and punching rounded corners, slots, notches and other features. To blast its welding bottleneck, Midland Metal Products sought a to bypass the welding operation altogether and look for a solution using its turret-punching operations. To the front stepped Mate sales engineer Chris Scherer, who recommended developing a prototype and finished panels using Mate’s threadform tool. Since the firm powder-coat paints all of its displays, the previous design using welded fasteners required masking plugs to keep threads free of paint. In some cases, operators had to manually clean the painted nuts so screws would fit freely into them. In contrast, the threaded helix made with the new threadform tool requires no cleaning after painting. Screws fit and turn easily using simple hand tools. McDonald quantified the cost savings using the new threadform tool several s. He calculated a direct-savings benefit of one cent for each of 24 threadforms per display, compared to 15 cents each for the same number of welded nuts per display. The direct savings from eliminating welding was significant due to the elimination of secondary operations. Also eliminated was the need to move each display panel to the welding station, as well as setup and welding time for each nut. 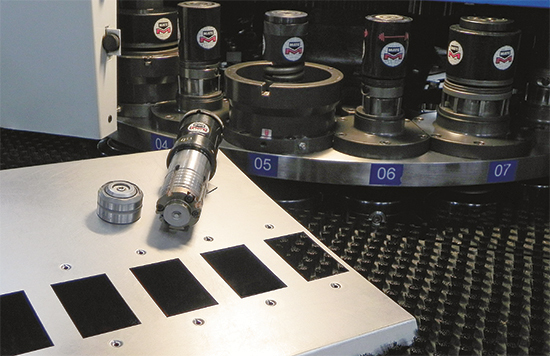 Indirect savings also prove significant, beginning with the elimination of labor input—once the threadform tool is loaded into the press turret. Also, the tool operates at 200 hits/min., much like a standard piercing tool, so actual production time for threadforming is much lower than for welding. Energy savings has proved to be substantial as well, and there’s no need to inspect the painted holes or clean the threads. Anticipating future similar projects benefiting from the threadforming process, McDonald ordered six additional Mate Hybrid Threadform tools to handle 14-, 16-, 18- and 20-gauge material. Article provided by Mate Precision Tooling: 763/421-0230; www.mate.com. Nice, no mention that this tool was developed at Nu-.